As we approach the end of summer, you may be wondering how you’re going to keep your garden thriving in the coming months. As we approach the end of summer, you may be wondering how you’re going to keep your garden thriving in the coming months. Surely, there must be some kind of plant that will last into the fall! Of course, we’re experts when it comes to finding out what kind of landscape or garden to keep around your home. And so, we’ve complied this list of summer garden ideas that will stay fresh throughout the tail end of summer. Fertilize your lawn: Now that there’s going to be less of a chance to water your lawn with a sprinkler, planting new grass and using fertilizer is going to be your best friend. Keep your flower bulbs: For example, if you have tulip bulbs and want them to bloom next spring, collect them and put them in the freezer during the coming months. This will assure full growth. 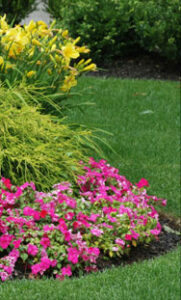 Plant perennials: A good fall perennial is a mum. Your local florist will be able to show you a plethora of great perennials to plant in your garden during the late summer. Plant for fall, store for spring: Freezing the seeds from the heads of your summer flowers will keep them fresh and ready to plant for next year. Meanwhile, start planting your fall flowers early. Bring plants inside: If you can, bringing in your plants can mean they’ll stay alive when the season gets colder. Keep them in a light area of the house and, if they’re healthy, they can be planted again in the spring. Prepare for mosquitoes: In late summer, mosquitoes will start to breed in large numbers. You can prevent this by ensuring there is no standing water around your yard. Make sure you’re continuously changing bird bath water. Also, keep a good stock of organic bug spray, or organic insect repellant candles. Need a gorgeous landscape? Atlantic Maintenance Group can help! If you are looking for help transforming your yard into something that stays beautiful in the heat of summer and the chill of winter, Atlantic Maintenance Group is ready to help you with our variety of landscaping, asphalt, snow removal, outdoor lighting, and concrete maintenance services. We are experts in our field and we are prepared to meet your needs with a price and product that will leave you grinning. If you’re interested in getting a free quote or more information, visit us online or give us a call at (410) 768-4720. To see examples of our work and stay up to date on our specials, follow us on Facebook, Twitter, Pinterest, and Google+. This entry was posted on Friday, August 5th, 2016	at 4:35 pm	and is filed under Blog, Landscaping Maintenance	. You can follow any responses to this entry through the RSS 2.0	feed. Both comments and pings are currently closed.